I have a Magic Track Pad so my favorite way to open Notifications is dragging two fingers from the very right hand side of the trackpad to the center, but if you prefer you can simply press the Notifications button in the very right hand side of the menubar. With your cursor inside the notifications area, scroll downwards. 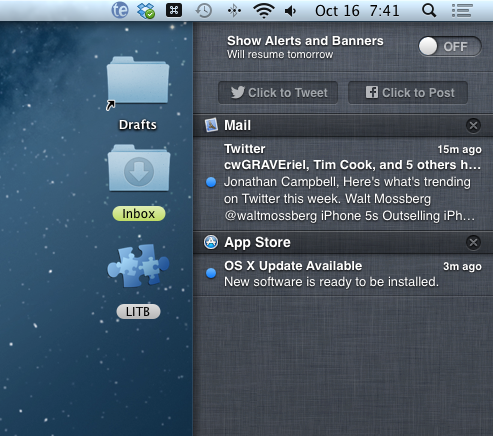 When you scroll down you'll discover a new area in Notifications with a On/Off switch marked "Show Alerts and Banners". Click on the Click the On/Off switch to turn Notifications temporarily off for the rest of the day. If you find you need to turn Notifications off frequently then you can also use this one step technique. Hold down the Option key and click on the Notifications button in the Menubar. The Notifications button will turn grey to let you know it worked.